It’s tough out there for a teen, especially when your dad’s the Grim Reaper. In this short story, written as a quatrain poem, we meet Dreary, a skeleton who frets about his future. He’d rather die than grow up to be like his dad, waving a scythe and ushering the dead to the underworld. He commiserates with his friend, Naughty, the daughter of Hade’s Gatekeeper. Dressed in a crop top and low-slung mini (to show off her devil tail), she rejects her laid-out future as well; she’s not convinced she wants to rule Hell. But, unlike Dreary, she has already broached the subject with her father, and she nudges her pal to do the same. Mr. Death isn’t an easy sell, however. He reminds Dreary that he’s part of an important legacy and reviews the many facets, the A,B,C’s, if you will, of this grim job. A is for arsenic, quite subtle you know. B is for band saw, no new head will grow. C is for cudgel, for striking a blow. D is for dungeon, a process that’s slow. And so on, all the way to Z. Dreary can’t be convinced; he wants no part of this Reaper business. Later, when he meets up with his friends, War, Famine, and Pestilence, it turns out they all suffer from the I-gotta-be-me blues (Famine whines to his dad that he just wants a chimichanga). Whether Mr. Death ultimately gives Dreary his blessing is left a mystery, but the overall message, albeit heavy-handed, is clear: life is short, so follow your heart. Monsters and romance make an interesting combination for young people. It is not often one can find a rhyming picture book at the sixth grade reading level. Because it is a rhyming picture book for older children, many higher level words are used which might help to build vocabulary and comprehension skills. Since the book is so short, it is not likely to find its way onto many reading lists, but will be a good way to get reluctant readers engaged. Dreary & Naughty: Friday the 13th of February is a most unusual book for older children. The two protagonists in the book are sophomores in Whispering Hills High School in a small, monster-filled town. 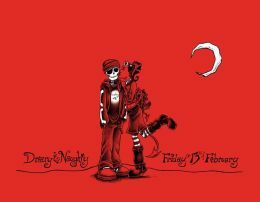 Dreary is a skeleton boy and Naughty a beautiful devil girl. All the boys have a crush on Naughty, but it’s Dreary with whom she spends her time. The last day of school before Valentine’s Day, Friday the 13th of February, finds Dreary with nary a Valentine card while Naughty has received hundreds. They spend the evening with Greta Ghoul watching movies at Naughty’s house. Dreary spends the rest of the night working on a wonderful, handcrafted gift for Naughty. When he presents it to her on Valentine’s Day, Naughty realizes Dreary is the one for her. She has nothing for him, but it’s not too late. The story is a sweet one for a book full of monsters, and young people will enjoy the story. The rhyming is often forced, there are several near rhymes, and the meter is uneven at best, but the artwork, the characters, and the story will find fans for this book and the others in the series. Reluctant readers will be enticed by this little book. Shawn Dubin has a web site focusing on his art at http://shawndubin.com/ and a blog at http://shawndubin.wordpress.com/ which students should find interesting. 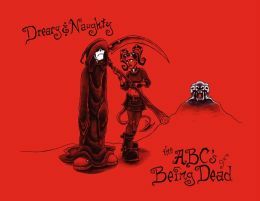 There are two other picture books by the same authors in this series: Dreary and Naughty: The ABCs of Being Dead and The Misadventures of Dreary and Naughty. Dreary and Naughty are new kids in school. How will the other students relate to them? After all, Dreary and Naughty aren’t your usual middle or high schoolers. Dreary is the son of the Grim Reaper and Naughty the daughter of the Devil. The parents have sent their children to a school for mortals to help Dreary and Naughty learn about the inhumanity of mortals. Black and white sketches illustrate the right side of each double-page. Only Dreary’s skull face shows under a hoodie; Naughty has haunting vacant eyes and wears edgy teen clothes. The homes of Dreary and Naughty are creepily made of bone and fire. While an obvious lesson for numerous classroom or club discussions about divergent lifestyles and acceptance, and while it has the appearance of a picture book, it is definitely not for the young reader. The illustrations of the students in the school are very obviously middle or high school; the main characters are seductive and blatantly evil looking. The other students wear the usual school jackets and preppy outfits, but their thoughts and actions indicate they are prejudiced. This is the first of a slightly revised version of a 2003 trilogy initially published by Dragonfly Books featuring Dreary and Naughty. In 2003, the book was ahead of its time, featuring characters not part of mainstream literature. A current, more open culture may be drawn via interest in the occult and paranormal.